As many stories begin, it was a dark and stormy night. Any light from the moon or stars was cut off by the thick rain clouds that seemed to stretch forever in every direction. The sound of water crashing down everywhere thoroughly drowned out any other noises, the only exception being the howling wind that threw the rain in a different direction every few minutes. This all did a fine job of delaying a transport boat that was already terribly behind schedule. It was late off the docks for disorganization reasons. There was a fight between crewmembers, which lead to a handful of other problems. The ship started towards the wrong place at first. And then the storm during everything else. The boat was supposed to arrive sometime in the afternoon, and now it was close to midnight. The boat was maybe the size of a respectable house. At the bottom was a long room for all of the rowing men. Above that was a cargo bay and sleeping quarters. Lastly, there was the upper deck which also had the captain's quarters. Besides the usual ship crew, the boat had a few passengers it was escorting to Gregory Anderson’s island estate. One of them had brought along a few farm animals and other produce, which currently were in the cargo bay. They each had their own business with Mr. Anderson, though each would be staying with him for at least a week most likely. The boat was to turn around and leave once they were dropped off, much to the crew’s dismay. On the northern horizon, the direction the boat was headed, a light could be seen. It was the lighthouse of the island, and, judging by its distance, the boat would be arriving shortly. So it’s up to you what you brought along. As said earlier, I’m going to try not to be a stickler about items. I imagine those with wagons or caravans probably did not bring them, just because they’re not really needed and might not fit. Suitcases with paperwork is probably common, and some clothing. This is a chance for you all to introduce your characters and maybe get a bit acquainted. No need for spoilers right now. Feeling a bit restless from the extended journey, Chitanya was making her way around the boat, hoping for something to help the time pass more quickly. She was seriously considering going down to lower level where the rowmen were, but figured they had their hands full with the storm and all. She would have been above deck if is wasn't for said storm. So, she just continued to wander around seeing what there was to see until they finally reached their destination. ooc: You just had to start it that way didn't you... Might as well be an entrant to the Bulwer-Lytton contest. John was sitting in a remote corner of the ship busy writing away in his notebook, only taking a second to look up and acknowledge the light that was shining in. Inlaid turned restlessly in his bed/cot/bunk (Not sure exactly what the accomodations are), trying and failing to drift into peaceable sleep. The merciless and unforgiving tempest stymied his efforts, and unto the raging sea and weary craft its fury did fall. Surely, Inlaid thought, surely this storm shall be my end. What terrible power has brought itself to bring doom upon our voyage; to deem fit our deaths at the clutching hands of a cold, watery grave? Inlaid sat up; a grimace of fear and discontent distorted his already unpleasant features. Ever since his uncle had been struck down by a thunderclap, Inlaid had been terrified of storms. Even a light drizzle, a rolling fog, or a moderate rain could upset his nerves, putting him into a state of panicked confusion in the worst cases. In his heart, he knew the craft which bore him and his companions to-be was a worthy vessel, capable of withstanding a storm such as this. Or was it his gut? Either way, he wasn't terribly certain and this uncertainty began to gnaw at his stomach. Inlaid stumbled out of bed, his legs unaccustomed to the rolling and churning of a large body of water, and quickly rummaged through his personal belongings. Removing his comfortable shoes from his things, he placed them on his feet, and drew a woolen cloak around his shoulders. He also placed a small knife into its sheath on his belt, and his lucky compass into an interior pocket of his shirt. Inlaid believed that it paid to be prepared, and prepared he was as he left his quarters. Should the vessel capsize, flood with freezing brine, or an agent of evil - a monstrosity from the depths - assault the transport, Inlaid was prepared. And hungry. He hoped to find someone companionable enough to share a share of bread. If no such candidate occupied the storm-beaten craft, there was always the cargo hold. OOC: Like I said, it was never explicitly stated what the sleeping arrangements were onboard. Latheron was coming from the cargo hold, greedily munching on a rather large piece of bread. He had another piece, not quite as large, in his other hand. I'll be eating well here. Thought Latheron. He was wandering about the ship, though he didn't dare go up on deck in this crazy storm. He was just relieved he was inside the ship! When he ran into someone looking for bread, he gave his other piece away without a second thought, before heading back down to the cargo hold after finishing his current piece. Latheron intends to nab some more food. Not sure if it should be spoiled or not, but figured I'd let you know. @Glyph: I suppose it wasn't clear. There's three levels; bottom and middle levels and the upper deck. Sleeping quarters would be middle. I realize I forgot the kitchen. I suppose there'd just be food in the cargo bay. I also forgot the bathroom, though I suppose you might not really need one (if you're a guy). Kind of just waiting on Rekee and Kibagami at this point. The boat had a pipe system used to communicate from one place to another. "Dock's ab'aht two 'andred ya'hds nort', fift'ay east. Sta'hboard, lah'en up!" The captains voice hollered through. It seemed like he was in a bad mood, but that might have just been his nature. The large room smelled like crap, literally, because of all the farm animals in there. The rocking of the boat had them all wound up. OOC: @ DB: No, you were perfectly clear on the layout of the boat, my only confusion was to the state of the indivual sleeping quarters. Are they private rooms, or is it a larger barracks-type of setting? If they are indivual rooms, how big? Do they have any kind of furniture in them? Windows? ooc: Well, looks like I ain't the earliest. Oh well. Are the farm animals mine? Raydan Silvercross sat in the cargo bay, leaning against the wall idly while whistling a tune. He had always loved whistling ever since his father though him how to, oh so many years ago... The past held painful memories for the country boy, so Raydan tried his best not to think about it too much. He played with a lock of his long blonde hair for a moment, before yawning and closing his eyes, trying to ignore the rocking of the boat and get some rest. He didn't get seasick, thankfully, but he was still tired. I hope this goes well, he thought slightly wearily. A large bearded man tramped into the cargo hold, using a mace as a walking stick. His eyes shifted from crate to crate, some a little longer than others. He also noted the extra company. "Nobody takes what is not theirs," he warned, before turning around. "If something of mine goes missing, you will have my mace to answer to." Latheron gulped. He wouldn't survive two seconds in combat. And he knew he wouldn't, too. Taking discretion over valor, he quickly scurried upstairs, then decided to be daring and go up on deck. He also grabbed an umbrella. @Glyph: Barracks style, mostly just beds, some small windows. @Kibagami: The farm animals are yours, yes. @Everyone: A reminder to try and keep inner thoughts to a minimum. For certain reasons I don't want to explain my purpose behind this, but basically it has to do with players not knowing things their characters shouldn't. For the next few minutes, the captains orders could be heard through the ship's megaphone system. It was hard to tell what was going on from the lower levels, but the ship was being navigated to the island dock. The captain's order to dock and unload stood out, and the crew started running around the ship, particularly to the upper deck and cargo room. A ramp-door like contraption opened up in the cargo room at the front of the ship, allowing the animals to be walked out onto shore and for supplies to be carried out similarly. A ramp was dropped from the upper deck onto the dock. Outside, it really was pointless to try and stay dry, as the rain was flying in everything direction. The shining lighthouse was the most prominent structure on the island, only a few yards away. It looked like a three legged ladder that crossed at the top, and had some kind of roof at the top housing the large lantern. A moderately large shed was just as close on the other side of the dock. The estate itself, a respectably large two story building, stood at the center of the island. A roofed porch that went all the way around was apparent, and also the fact that only the center of the building seemed to be illuminated. Off in the distance on the other side of the island, a barn could be made out. Crew members with crates seemed to be headed that way. I'll try to post the map every page for convenience's sake. With his umbrella, Latheron walked out onto deck. Aside from the rain, he found the scenery to be rather nice, and likely relaxing, should the rain let up. He took a deep breath, then coughed from the rain he inhaled. He noted not to do that again. He took a step forward, and was grateful for his shoes as he trekked towards the lighthouse. He inspected every aspect of it, looking for any way to climb up. The most important thing is that it's like a teepee. The main structure of the light tower was three trees (less than a foot in diameter) standing up against each other like a teepee and bound tightly together at their intersection. Their bottoms were buried partway underground. Across the three main legs were horizontal sticks that served as steps, each thick enough to bear a man's weight and tightly bound. These continued up past the point where the main legs crossed each other. The top was almost like nest, in concept at least. In there was the giant lantern. A roof had been built over it to keep the water out. After memorizing the design, Latheron went over to the shed, closely inspecting it, inside and out. He was also sure not to get in anyone's way as he did so. Glad to have finally reached their destination, Chitanya made her way back to the sleeping quarters where she had left her belongings. Making sure that everything was where it belonged she placed her large bag over her shoulder and picked up her satchel. Stepping outside and viewing her surroundings, making a note of them for a visit soon, she made her way straight to the estate. Due to the lateness of the hour, she hoped that there would be someone to greet them and show them to their rooms. Wanting nothing more at this point than to just get dry and have a nice place to rest. She could not help but admire this place that she had come to. ooc: Sorry I'm late, couldn't log in on my phone since I had to reset my password... Also, by 'farm animals', do you mean cows and stuff or monsters like Aptonoth? Raydan stood up, yawning in boredom. "Well, that was an interesting journey," he said with a hint of sarcasm, before hopping to his duties and getting the animals off the ship. The large bearded man stood between the dock and shed, mace in hand, his hair braids flailing in the wind. He oversaw the crate procession, mentally noting which crates of his had been carried out. Upon seeing two men carrying a chest wrapped in chains, he stuck out his mace across their path. "That chest follows me into the house," the man barked over the wind. "This way." John tucked his book away and under his jacket before having a sailor carry his medical supplies up to his room. Alright everyone, we're gonna start using spoilers now. Remember 'not' to label your spoilers. @Kibagami: Regarding the farm animals, I suppose it doesn't matter, but for the sake of monster hunter we'll say Aptonoths, Mosswine and Gagua. I just remembered you have spoiler issues... I'll send you a private message. The front double doors of the estate were opened up by a tall and large man from the inside, who went about fixing the doors in their place as three of the house guests (Star, Rekee, Sunfish) and some sailors made their way over. Inside, the building was of respectable decor. Any woodwork was of fine craftsmanship, the floors were carpeted, and everything was maintained and cleaned. Directly ahead, a pair of stairs going opposite ways lead to the walkway of the second floor. Between the stairs was a hallway leading back outside. It seemed to be the case for both floors that doors were spaced out among the walls on both sides. The only asymmetrical door was one on the side of one of the staircases (east). Overhanging and illuminating the entire room was a large chandelier, though the big man had a few other candles lit as well. He looked to be a little over six feet in height and over two hundred pounds in weight, a barrel chested man. His attire was that of a physical laborer, and his calloused fingers supported that idea. He was completely bald and shaven, and had a bit of a baby face, albeit probably somewhere in his mid twenties. "Hi there." He greeted the others in a friendly manner, albeit a little tired. "Your, uh, the guest room is up there." He pointed to a door to the southwest on the second floor. "If you need anything, lemme know." His attention seemed to focus in on the large chest, but the sailors took it upon themselves to start bringing that up. @Star, Sunfish, Rekee: Continue to read each other's spoilers for now, though if you get the feeling you shouldn't, ask first. 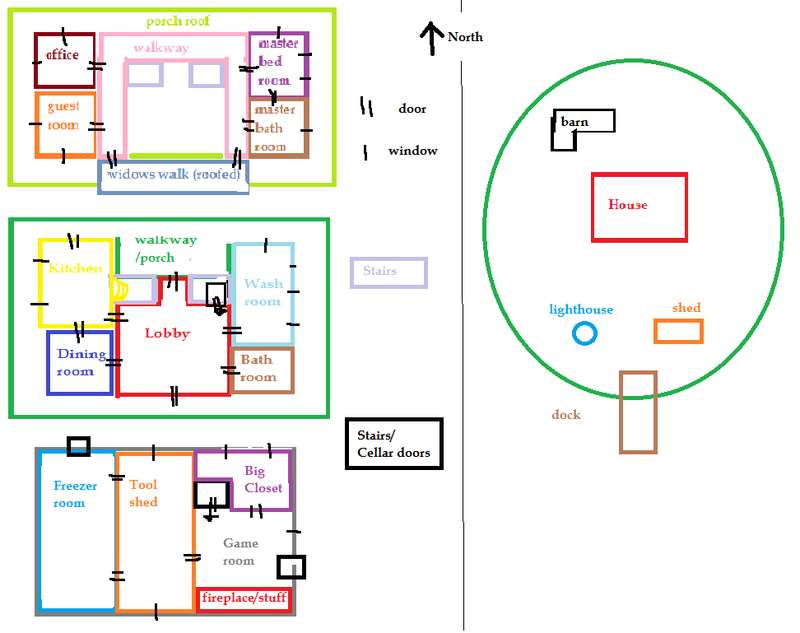 Remember the map of the house. The shed had a small side door and a larger set of double doors. Inside, it seemed like most any other tool shed. What may have been a bit uncommon were water related things like paddles and a canoe. Only one sailor followed Latheron, bringing what looked to be fishing supplies. He put it down off to the side and then went back towards the ship. It was a little hard to get a really good look at the chained chest as it was brought in, considering the distance, weather and darkness. From what Latheron could see, there wasn't anything particular about it. The men with livestock went towards the barn. There was a cellar door underneath the porch on the west side of the north wall of the estate. Men with produce were bringing the crates in wherever the door led. By standing at a certain point both groups had to pass, Raydan was able to keep track of everything. I'm not sure how he'd be recording everything. Paper would probably get soaked. Chalk might work, though I'm not sure if he'd be that prepared. Satisfied with his findings, Latheron made his way up to the estate, before pausing and looking to see if anyone would be able to see him. Three of the house guests (Rekee, Star, Sunfish) were still by the front door (on the inside), as well as the big guy from the house. The other guest (Kibagami) had gone off somewhere to the west side of the building, and was unseen. Sailors were still going back and forth between the west side of the estate and the dock. ooc: so it's a shared bedroom right? "I need a towel," the bearded man said as he followed the crate up the stairs. "A dry one." "Thank you. And I really could use a towel myself." Chitanya says as she makes her way up to the designated door. ooc: Words fail to describe how much I hate my crappy phone right now. Raydan walked to the spot where he could keep track of everything better, deciding against looking for anyone for the time being. He had a job to finish, and if anything urgent came up, they could always find him here. Maybe I should try and pick up that bard girl, Raydan thought, although he didn't actually plan on a seriour relationship. ooc: Oh god. He's so... hard to roleplay. Not my style. Latheron entered the large house, looking around and examining the inside. He'd examine the outside later, but for now, he wants to find out where Iskander was to sleep. OOC: That's a lotta spoilers. Inlaid gathered his things and followed the group off of the boat. From now on, please use spoilers as well. Some information that's not relevant to you might come up as well. Just kind of bear with me. Nothing in particular happened. Livestock and produce were brought to where they needed to go without a hitch. In good time, everything was all done. The sailors were starting back to the ship. They weren't quiet as organized as Raydan may have been though, as they left the barn doors wide open, and also the cellar door. The skinny kid (Blaster) and the short guy (Glyph) caught up with the rest of the group (Rekee, Star, Sunfish) inside the house. The guestroom is a shared room, yes. The skinny kid (Blaster) and the short guy (Glyph) caught up with the rest of the group. The sailors (carrying the chest and suitcase) continued upstairs to the guest room, followed by the rest of the group. "R-right." The big man said before hurrying off into another room on the first floor (northeast). Upstairs on the walkway, some painted pictures were on the walls. One of them was a picture of a middle aged man and Melynx holding up a big red fish, each bearing wide smirks. The fish probably weighed around fifty pounds. The plague read "Anderson and Jordan, (Insert Random Year), Lacrimosa Lake". The guest room was simple and humble, but otherwise had no real flaws. There were eight beds, each with a neighboring nightstand, candle and matches. There were two windows, one of which showed the light house and ship. "Where's this goin'?" One of the two sailors asked the larger house guest (Rekee). "Where's this?" The other one with the suitcase asked another guest (Sunfish). @Sunfish, Star, Rekee, Blaster, Glyph: For now, read each other's posts/spoilers, because you're all in the same room together. "Put it under the bed closest to the door." John said as he sat down on said bed and began looking over his journal once again. Chitanya chose the bed closest to the window that overlooked the lighthouse. She liked to hear the rain, finding it relaxing. She set her bags upon the bed and waited until she could dry off before sitting on it and getting it all wet as well.